If you want to try out this millenary tradition, just check out the Mandalas to Color app for iOS! 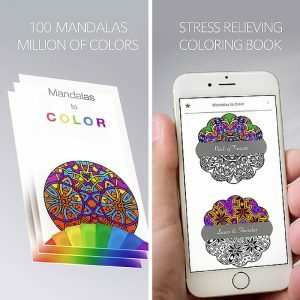 Within this brand new application for iPhone and iPad, you will be able to find 20 free beautiful mandalas (up to 100 if you upgrade to the Premium Version!) for your meditation on which you can try out the power of chromotherapy. Moreover you can find the right atmosphere to your mandala meditation by playing some of our well known relaxing music in the background, included inside the app. Try the color therapy and get all the relax you want! We are sure that Mandalas to Color will give you serene stress relieving moments, and help you coping with anxiety and stress. Download it now and relax with the color therapy! Mandalas to color is all the rage right now! But how about some “scary” mandalas, when we are in the season? 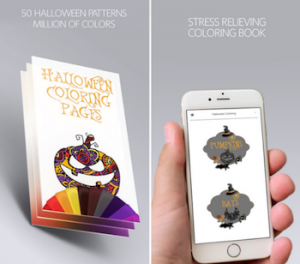 Halloween Coloring Pages is an amazing app that will help you to relieve stress and create amazing backgrounds for device. A digital coloring book for kids and adults that includes a collection of 50 beautiful images to color. Fill in the color, and complete the most beautiful halloween background of them all. Choose between some predefined color palettes for your art, and unlock infinite colors on the premium version. Finally, find the right atmosphere to color by playing some music in the background, specially conceived for this app. Follow this link and download Halloween Coloring Pages for iPhone and iPad! 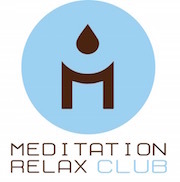 Meditation Relax Club provides music and support for an app that has recently launched on the iTunes store. It’s the “Chakra Meditation Balancing App“. If you own an Apple device with iOS 7.0 or higher, check it out over here (note for Android users: the Android app is currently under development and will be released as soon as possible!). The app is free, and was created to help you heal your chakras. Each Chakra is associated with different colors and different sounds. Chakra Meditation Balancing was devised and studied to help you tune your Chakras through meditation. Just tap once the buttons and a soft tune related to that Chakra will start. Tap again to stop it. We put a lot of passion in creating this app, and decided to make it FREE so that everyone can enjoy it and use it to improve their spiritual life. Meditation Relax Club is proud to have provided the chakra music for this project, and hopes you will enjoy it as much as we did creating it. Download Chakra Meditation Balancing Now. Delta Waves is an app that allows you to recreate the Delta Frequency (waves emitted between 1 and 4 Hz) helping you sleep deeply. Start the frequency, and adjust it to your liking by moving your finger across the slider placed on the sound-wave at the center of the screen. You can start the app by pressing the Delta button on the top left before going to bed; you will notice a significant change in the quality of your sleep during the nights where you use it. We strongly suggest the use of headphones while using it. To help you sleep even better, you can choose to add 7 different songs and 5 sounds of nature to the Delta Wave to relax even more. The built in timer allows you to set how much the app will play. Finally, you can change the background color through your settings: choose among 5 relaxing Delta Wave inspired tones. By purchasing the full version of the app, you can unlock and enjoy all of these functions and improve your experience. Download Delta Waves from iTunes App store now! Gamma Waves are medium amplitude brain waves that are associated with the state of deep concentration and awareness. They have a frequency ranging from 25 to 100 Hz, although 40 Hz is typical. Gamma Waves is an app that allows you to recreate that sound and that neural oscillation, helping you concentrate more. Start the frequency, and adjust it to your liking by moving your finger across the slider placed on the sound-wave at the center of the screen. You can start the app by pressing the Gamma button on the top left before starting your study session; you will notice a significant change in how much you are able to concentrate and stay aware while studying. We suggest the use of headphones while listening to this powerful sound. To help you study even better you can activate the in-app purchase that will allows you to add 7 different classical piano songs to recreate the famous “Mozart Effect” for brain stimulation and 5 ambiance noises to the Gamma Wave to ease you up. The built in timer allows you to set how much the app will play. Finally, you can change the background color through your settings: choose among 5 inspiring Gamma Wave inspired tones. By purchasing the full version of the app, you can unlock and enjoy all of these functions and improve your experience. Download Gamma Waves from iTunes App Store now! Theta Waves are high amplitude but slow cycled brain waves that are associated with a state of deep meditation and mindfulness. They are extremely slow, and cycle about 4-7 times per second. Theta Waves is an app that allows you to recreate that sound, helping you meditate deeply. Theta Waves can emitts a waveform at 6 Hz: start the frequency and adjust it to your liking by moving your finger across the slider placed on the sound-wave at the center of the screen. You can start the wave emission by pressing the Theta button on the top left before starting your meditation session; you will notice a significant change in the quality of your meditation while you use it. We strongly suggest the use of headphones or quality speakers while using it. In addition, you can choose to add 7 different meditation songs and 5 sounds of nature to the Theta Wave to relax and become even more mindful. The built in timer allows you to set how much the app will play. Finally, you can change the background color through your settings: choose among 5 relaxing Theta Wave inspired tones. By purchasing the full version of the app, you can unlock and enjoy all of these functions and improve your experience. Download Theta Waves from the Apple App Store now! Alpha waves are one type of brain waves predominantly originate from the occipital lobe during wakeful relaxation with closed eyes. They are emitted on an amplitude range between 8 and 15 Hz: these kind of waves are associated with a state of deep relaxation and stress release. Alpha waves are strictly connected with relaxed mental states, so increase in alpha wave activity is a desirable outcome for some types of biofeedback training. Alpha Waves recreates that sound, helping you relax in a more profound way. Alpha Waves can emits a waveform at 11 Hz: start the frequency and adjust it to your liking by moving your finger across the slider placed on the sound-wave at the center of the screen. You can start the wave emission by pressing the Alpha button on the top left before starting your session of relaxation; you will notice a significant change in the quality of your moments of relax while you use it. We strongly suggest the use of headphones or quality speakers while using it. To help you relax even better, we added several in-App functions. You can choose to add 7 super relaxing chill-out songs and 5 sounds of nature to relax more and finally find a total relief from stress. The built-in timer allows you to set how much the app will play. You also can change the background color through your settings: choose among 5 relaxing Alpha Wave inspired tones. By purchasing the full version of the app, you can unlock and enjoy all of these functions and improve your experience. Download Alpha Waves from the Apple App Store now! Beta waves are a type of brain waves associated with normal waking consciousness and a heightened state of alertness, logic, critical reasoning and problem solving. Beta brain waves are important for effective functioning of your mind throughout the whole day and they dominate your normal state of attention and cognition. Beta Waves emits a waveform at 25 Hz: start the frequency and adjust it, then start the wave emission by pressing the Beta button on the top left when you need to stimulate your mental activity; you will notice a significant change in the quality of your focus and alertness while you use it. We strongly suggest the use of headphones or quality speakers while using it. Besides this, we added several in-App functions. You can choose to add 7 very mind stimulating electronic songs and 5 ambient noises to focus more. The built-in timer allows you to set how much the app will play. You also can change the background color through your settings: choose among 5 Beta Wave inspired tones. By purchasing the full version of the app, you can unlock and enjoy all of these functions and improve your experience. You can download Beta Waves from App Store now! Do you have trouble making your baby fall asleep at night? Fear not, as from now on you will be able to rely on the help of “Baby Sleeping Music”, a simple but useful app that was created to help your baby fall asleep with the use of relaxing sounds. Just start up the app and touch one of the objects that the room contains. A soothing, unique song will start and continue playing until you stop it. Let your baby fall asleep with the sweet sound of a music box melody, some calm piano music or a famous traditional lullaby. All of these are free for you, as we chose to make the basic version of Baby Sleeping Music available for everyone to download. In app purchases allow you to unlock the potential of Baby Sleeping Music to its fullest. Download now the app for iOs (note for Android users: the Android app is currently under development and will be released as soon as possible! ).